August 11, 2019 – Colin Fowlie has a gift of captivating any audience and making you feel like you’re the only one in the room. 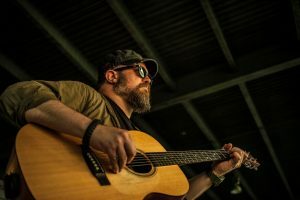 Headlining the 4th annual Marky-Poolooza in Keswick, NB, an annual outdoor house show featuring regional music, Fowlie brought his Trio to play two sets mixed with new original music, unanticipated covers, and songs typically performed with his full band, Art of the Possible. Fowlie’s narrative songwriting is easy to connect with and you find yourself immersed in every story he’s trying to tell. Whether it’s about that toxic person living through a filter, someone who’s stuck in life, or even just looking for a good time; we all know someone who can relate to the circumstance. Or, maybe it’s even you yourself. During the first set Colin Fowlie shows his more bluesy side with songs like Amusement Park, Harmony, and Passerby, and finishes with a Drive By Truckers tune, Goddamned Lonely Love. After a short break the Trio begin their second set with a request from the crowd, the only actual reminder that there are many others there experiencing this moment with you. His rendition of Jason Isbell’s Cover Me Up is incredible and moving, but don’t be fooled! He has a way of weaving plot twists into a story that you’ll never see coming. Able to adapt songs whether performing solo, Trio, or with the full band; he can make it feel like you’re always hearing his music for the first time, often catching something new that you might have missed before. There were laughs, there were tears, and there was a definite feeling that you were a part of something special. Colin Fowlie is currently working on a full length album due out in 2019. You can catch Colin’s weekly videos here to keep up to date on the album’s progress, Fowlie’s writing process, and future show dates.